Data conversion is an essential element for an organization considering to adopt a new system to replace the legacy system. Data conversion can be a complex and disruptive process which becomes a costly undertaking if not planned meticulously. People usually avoid ACT! to Microsoft Dynamics CRM data migration as it can be quite tedious. At Inogic, we give data conversion the attention it deserves and manage the whole process seamlessly with the assurance of minimal disruption to your business. We use Microsoft’s SQL Server Integration Services (SSIS) platform which is far more capable of performing a broad range of Dynamics 365 data migration tasks. You would never observe a dip in data transfer speeds as you shift from the legacy system to a new system. We concentrate on understanding our clients' business needs to augment our technical skills to ensure an effective outcome to our clients' projects. After extracting the data from different systems, it is consolidated and maintained in a single format apt for the next step, transformation processing. Here the data from the source system, ACT! 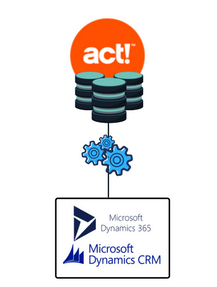 is transformed into a format that the target MS Dynamics CRM system understands. The transfer phase loads the data into the target Dynamics 365 Organization using the mappings between the two systems. Why choose our data conversion process?